Advances in commissioning — Martin Lowe. 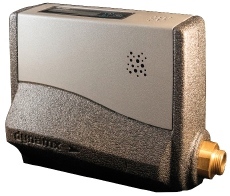 With electronic balancing for hydronic systems now available, Martin Lowe of Marflow Hydronics reflects on the problems that have beset the industry for years. No matter how much time is allocated, the balancing of water distribution systems never ends up getting enough. The job is often troublesome, stressful and difficult to complete as buildings are still being constructed. However, the introduction of electronic balancing could change all that, and the time needed to complete the task could be significantly reduced. Whatever the schedule has left for water balancing, by the time it can be started it’s often weeks later than first planned. This isn’t necessarily anyone’s fault; it could be due to weather disruptions, logistical issues, a too-ambitious programme or other unforeseen problems. With water balancing being one of the last tasks to be performed, it bears the brunt of all the previous problems. The balancing of water systems can be a cumbersome task in itself — without the added pressure of time constraints, especially with, for example, proportional balancing using manual balancing valves. It wouldn’t matter how many people were there to help, only one part of the system can be balanced at any one time. One change can throw the flow out elsewhere in the system, meaning it’s fruitless to do too much at once. The problems associated with the proportional balancing method have been lessened by the introduction of pressure-independent control valves (PICVs) that no longer need to be balanced as part of a complete system but can be commissioned in parts as the valve can accommodate the same flow at different pressures. Although this still doesn’t help with some of the other known issues. 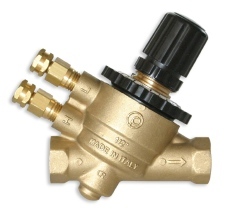 Pressure-independent control valves have the useful benefit of enabling systems to be commissions in parts. No matter what the technique, before balancing can even start, problems will always need finding and alleviating. An initial scan will identify the problem areas, which could be anything from an open future loop to a cap left on an installed pipe. Even when the work has commenced, it’s always inevitable that problems will crop up, reducing the little time that’s been left even more. Another growing issue is that of the budget. The pressure to save costs on a project has a knock-on effect, and often things get missed out, or, ironically, left in, and subsequently systems aren’t designed to their full potential. This underestimation can be a false economy. Although the costs may look less up front, by the time all the problems have been solved time and time again the longevity of the system has be compromised, meaning the actual cost of it in the long term has been far greater. One of the reasons to balance a system is to make it work at its most efficient. Proportional balancing is a costly exercise, but once completed it does make energy savings when the system is working at its optimum. However, because of its cost and the time involved, it can only be done a couple of times throughout a building’s life. And as it’s such a manual task, as soon as the job is completed it’s already out of date. This is where electronic balancing becomes a very viable alternative. By its very nature, electronic balancing cuts out much of the manual work. It continually brings information back to the user rather than the user having to walk around trying to find what’s going on themselves. Having flow-rate information to hand means just simple adjustments to the valve can make things work as they should. Information being fed to the user not only speeds up the process greatly, but it also makes it far more reliable as there is a whole view to analyse, not just individual parts of a system. This pressure-independent electronic flow-control valve uses Modbus to communicate information about flow and temperature and enables settings to be made. The problem of finding and troubleshooting elements of any system is by far the most time-consuming part to the process. If that could be changed to be a more automated process then immediately less time is needed to perform the task. When working on a major project, like the Olympics for example, there is no way that the commissioning can over-run — it has to be right. The Olympics would not wait because a fault couldn’t be properly rectified in a system, it has to be completed accurately and done so in the time allocated, so reliable tools need to be used. As with much new technology, the price would tend to be higher up front than a comparable, more traditional system, but the benefits that electronic balancing bring could save users a significant amount in the long term. Quicker and easier troubleshooting will not only save time, but will also cause minimal disruption through the lifetime of the building when changes need to be made, either due to unforeseen problems or just that of seasonal commissioning. In an amusing way it could be said that electronic balancing is for life, not just for Christmas. It will work with the lifetime of a building, helping it to reach maximum efficiency with least effort. Martin Lowe is managing director of Marflow Hydronics.